The top-six beach teams remain the same after this week’s AVCA top-15 rankings were announced. #1 USC is riding an impressive 44 match win streak – having taken down two top-ten opponents at the Gamecock Grand Slam. LSU continues to climb the rankings, improving to #7 in this weeks poll from the #8 position last week. The #7 position is the highest the team has been ranked in program history. Arizona fell to #8 after the Tigers were able to take them down in a 3-2 decision. 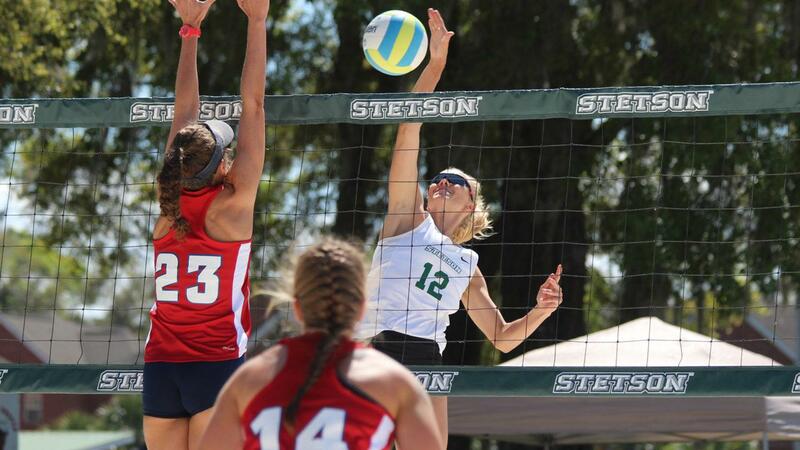 Making the greatest jump this week was Stetson, who cracks the top-10 at #9 after holding the #13 position last week. The Hatters took down then-tied for #9 teams Georgia State and South Carolina 3-2, but fell to top-five opponents #1 USC and #4 Florida State 1-4. With the losses (Georgia State and South Carolina), the teams fell back in the rankings to #10 and #11, respectively. Also falling back in the rankings was Arizona State to #12 from #11 after dropping a 3-2 decision against Nebraska. Grand Canyon fell to #13, while Florida Atlantic stayed the same at #14. Rejoining the top-15 is Florida International after a 4-0 weekend, sweeping all opponents, replacing California despite winning their only match of the week.